Senator Scott Brown voted for Wall Street overhaul, but emails suggest he sought a loose interpretation of a key rule. 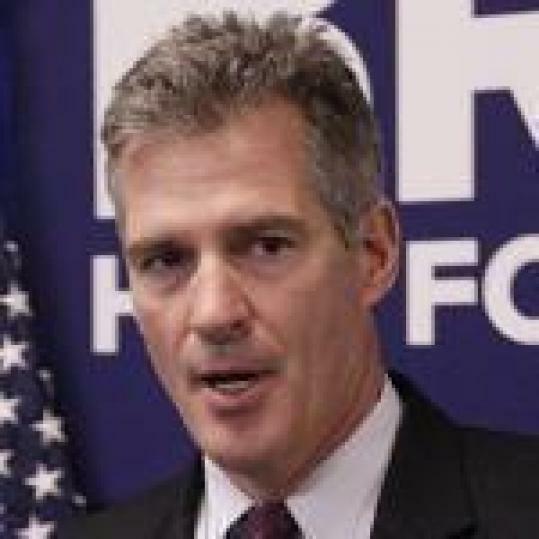 Senator Scott Brown has trumpeted his role in casting the deciding vote in favor of the 2010 Wall Street overhaul, but records show that after he voted for the law, he worked to shield banks and other financial institutions from some of its tough provisions. E-mails between Brown’s legislative director and US Treasury Department officials show that Brown advocated for a loose interpretation of the law so that banks could more easily engage in high-risk investments. While the law, known as Dodd-Frank, sets broad parameters for how the financial industry must behave, the interpretation of the law, and the rules that follow, will govern Wall Street’s daily business. At issue in Brown’s e-mails is the Volcker rule, a particularly contentious provision of Dodd-Frank. The rule, championed by Paul Volcker, a former chairman of the Federal Reserve, prevents commercial banks from speculating heavily in higher risk investments. Banks are federally insured, which means that if they fail, taxpayers must reimburse many depositors. Brown’s role in helping to loosen the Volcker rule in advance of casting his vote on Dodd-Frank has been well-documented. Notably, he helped create a provision that allows banks to invest up to 3 percent of their money in riskier investments such as hedge funds and private equity funds, and to own up to 3 percent of an individual fund - additions that won him Wall Street support. But e-mails obtained by the Globe show that Brown’s work on behalf of the financial sector did not stop when the law was passed. In the second stage, as regulators began the less publicly scrutinized task of writing rules amid heavy pressure from the banking sector, Brown urged the regulators to interpret the 3 percent rule broadly and to offer banks some leeway to invest in hedge funds and private equity funds. Supporters as well as critics of the banking industry agree that Brown’s suggestions would mean looser regulations for banks, though specialists disagree on the extent of the impact. “It’s giving [banks] maximum relief at the margins,’’ said Lawrence D. Kaplan, a former senior attorney for the Treasury Department, who now represents the banking industry in regulatory matters. Kaplan said that he believed banks were depending on Brown, among other lawmakers, to help secure that relief. “This is a treatise on how to gut the thing,’’ said Johnson, who has praised Brown’s Democratic rival, Elizabeth Warren, on his blog. Brown’s office declined to make the senator available for an interview. His spokeswoman, Marcie Kinzel, pointed out that Brown’s work on Dodd-Frank was repeatedly praised by Representative Barney Frank, the liberal Newton Democrat who coauthored it. Kinzel said Brown was primarily interested in protecting Massachusetts financial institutions, major movers in the state’s economy. Brown’s March 2011 memo was written by and e-mailed from Nathaniel Hoopes, his legislative director, who previously worked at the private equity arm of Lehman Brothers, to two Treasury officials - Barrett Hester, who served with Hoopes on the staff of Senator Joseph Lieberman of Connecticut, and Charles Yi. The Treasury Department is coordinating five agencies that are writing the rules, which have yet to be finalized. Hoopes’s e-mails mix dry policymaking with a lighthearted tone about the laborious process of government rule-writing. Brown also wrote a shorter, more formal letter to Treasury Secretary Timothy Geithner in June 2011, echoing some of the points made by his staff, with less detail. Ann Graham, a lawyer formerly with the Federal Deposit Insurance Corp. and an advocate of strict regulation who teaches banking law at Hamline University in Minnesota, said Hoopes’s memo urges regulators to “substantially undercut the Volcker rule’’ in ways that would allow banks to skirt the 3 percent limit on hedge fund ownership and delve into riskier investments. Three percent rule: The Volcker rule prevents banking entities from owning more than 3 percent of a hedge fund that they sponsor, or “seed,’’ within a year, to limit their exposure in these riskier investments. Brown argues that calculating the 3 percent should be done only once, at the end of the “seeding period,’’ when a fund is attracting initial investors. Critics say that could allow banks to actually take a greater stake in a hedge fund without running afoul of the rule. Hoopes wrote that the goal was to avoid a “fire sale’’ toward the end of the one-year period that could unsettle the funds. Carried interest: Brown wants to prevent counting “carried interest’’ - the share of profits taxed at lower rates than regular income - toward the 3 percent cap. This allows fund managers to continue earning high incomes at relatively low tax rates. Broader customer base: The senator also favors allowing banks to bring in more nonbanking customers to invest in hedge funds and private equity funds, rather than restricting those funds to customers who already have deposits in or relationships with the bank. Critics say that would put traditional bank deposits at risk and allow banks with large asset management businesses to invest more heavily in hedge funds. Hoopes argues that stricter limits would steer more investors into less-regulated corners of the financial industry. Hedge fund bailouts: Brown argues for a narrow interpretation of a provision designed to prevent banks from lending money to rescue troubled hedge funds, private equities, and other investments. The senator would keep the prohibition for funds affiliated with banks, but allow banks to bail out nonaffiliated funds with which they have other financial relationships. Critics say Brown’s view could lead banks to funnel their federally insured deposits into failing hedge funds. Hoopes argues that Brown’s position reflects Congress’s intent in Dodd-Frank. Bierman can be reached at nbierman@globe.com. Follow him on Twitter @noahbierman. Levenson can be reached at mlevenson@globe.com. Follow him on Twitter @mlevenson.